India has one of the fastest-growing economies in the world. Renowned for its IT and software development, it is an important component in the world’s technological advances. The prime minister of India declared the period of 2010 to 2020 the decade of innovation. 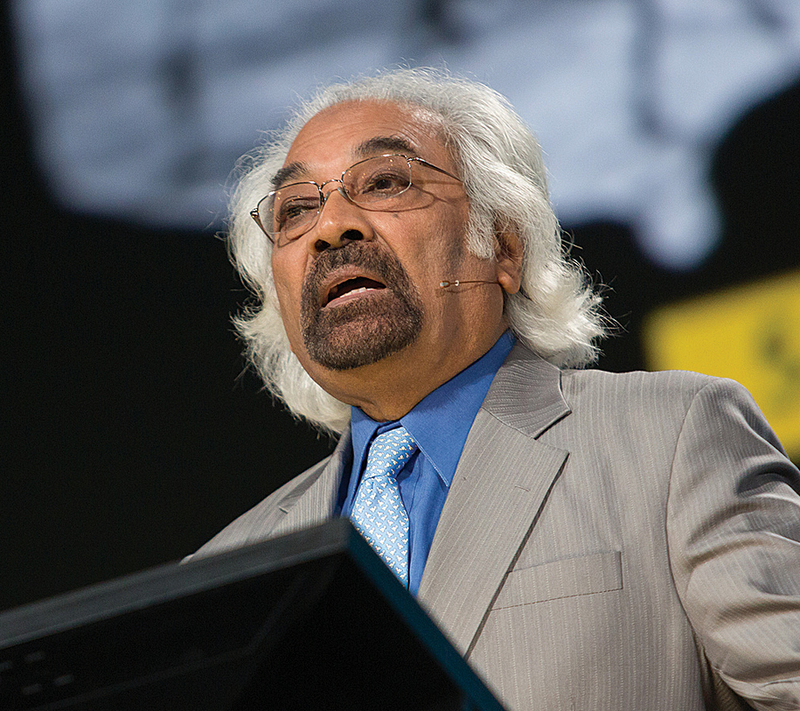 Sam Pitroda talks about India's National GIS platform. Sam Pitroda is the technology adviser to India’s prime minister and the thrust that is forwarding the implementation of a national GIS. “Technology is key for driving India’s development,” he said in his keynote speech at the 2013 Esri International User Conference. As a young man, Pitroda left India for 20 years to work in the telecom business in the United States. While visiting India on a business trip, he tried to call his wife from his hotel and could not make a connection. That day he committed himself to improving India’s communication system. Pitroda took up his mission in 1980, at which time the country had 2 million phones for 750 million people. Today, India has 900 million telephones for 1.3 billion people. He posed the question: what can 900 million connected people do? As the chairman of the national innovation council, his plan has been to build technological infrastructures that connect everyone to information. India’s development is challenged by disparity, demography, and the lack of infrastructure. To meet these challenges, leaders have designed a plan for expansion, which includes building more hospitals, schools, and roads; producing quality goods and services; and making the most of its investments. The plan includes a strategy for equity. The poorest of the poor will be served. In 2010, the World Bank reported that 32.7 percent of India’s population lives on less than $1.25 a day, while 68.7 percent live on less than $2 a day. In other countries, the populations are aging and decreasing; however, in India the population is young and growing, with 550 million below age 25. Each year, 25 million young people are added to India’s work force. Successful development means creating jobs for everyone. India has been ramping up its technology infrastructure with platforms that connect a large portion of the population to information. Its platform that connects voice has already been successful. Now the country is creating a platform to connect data for police departments, intelligence agencies, and food distribution. Next, India will create an identification (ID) platform that is connected to every resident via unique ID, including facial features, fingerprints, and iris codes. People will use their unique IDs to connect to bank accounts, mobile phones, ration cards, food distribution, and employment applications. Recently, India rolled out its Knowledge Network that connects all universities, libraries, and research and development institutions to improve collaboration and share resources. It is now designing a government network, which will tie 250,000 local governments together through optical fiber. The network should be operational in 18 to 24 months. It will allow India to reengineer its government processes and education system, help agriculture and health industries, and improve public service delivery. Today, India is building a nationwide GIS platform. For many years, the country has used GIS in bits and pieces for energy, transportation, agriculture, etc. It uses GIS for government projects and disaster management. By creating a national GIS platform, India will link together these activities and many others. Sam Pitroda, adviser to India’s Prime Minister for Public Information Infrastructure and Innovation, highlights India’s efforts to solve its challenges with geospatial technology.